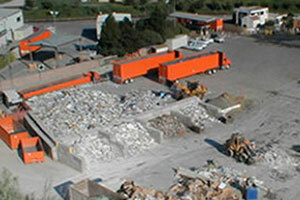 Accepts various types of construction and demolition debris, such as scrap aluminum, appliances, asphalt, brass, brick, bronze, cardboard, cast iron, concrete, copper, ceramic and slate floor tiles, gravel, metal (including empty propane tanks), pallets, roofing materials (wood, clay, and slate), sand, soil, steel, stone, tin and wood (including treated wood), and yard waste (including Christmas trees). Also accepts the following types of hazardous waste: antifreeze, non-friable asbestos, household and vehicular batteries, and used motor oil and oil filters, free of charge. Various types of electronic waste, such as audio and video equipment, computers, TVs, office equipment, holiday lights, and small appliances, are also accepted for recycling. In addition, the Landfill accepts tires, bicycles, and vehicle chassis, if they are cut into quarters for recycling. The Landfill is also a participant in CA's free mattress recycling program. Open Monday through Friday from 7:30 a.m. to 4:00 p.m. and on weekends and holidays from 10:00 a.m. to 3:45 p.m.